Update in gray. 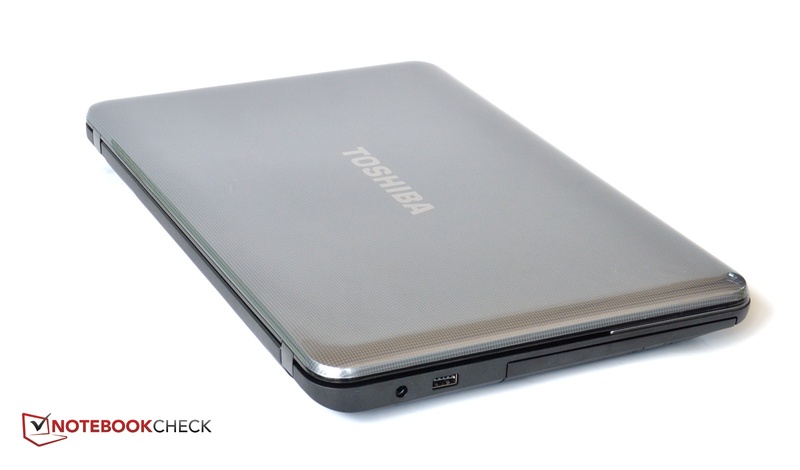 The Toshiba Satellite C855-2J4 is a 15.6-inch entry-level notebook. 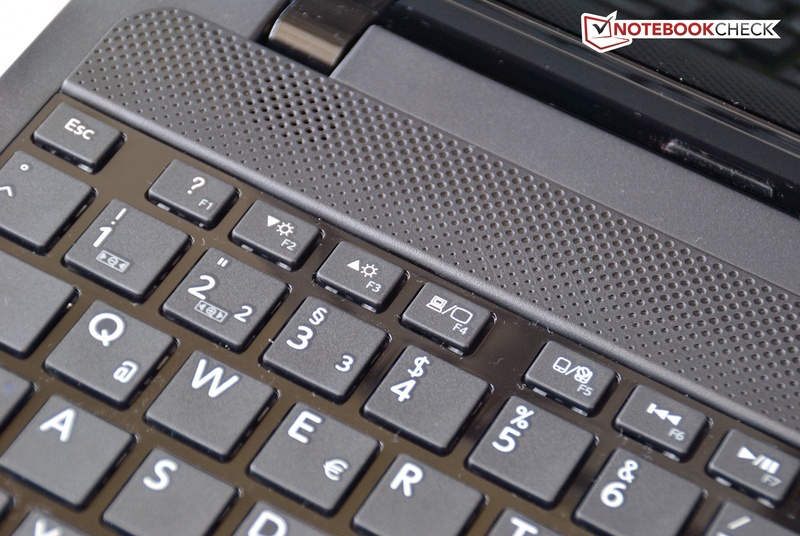 Equipped with an Intel Core i5-3230M processor and AMD Radeon HD 7610M GPU, the notebook is one of the more powerful models in Toshiba's entry-level series. With the Satellite C850 and C855 series, Toshiba offers quite a few different and rather inexpensive 15.6-inch notebooks. The new model is - aside from the internal components - fairly similar to the previously reviewed Toshiba Satellite C850-1LX. The exterior of our review model doesn't differ much from the C850-1LX. The plastic chassis is not all black, but features a gray palm rest and a gray pattern on the display lid. Unlike the predecessor, the lid is completely smooth, since the pattern is printed on and not an actual texture. The keyboard tray and the bezel of the touchscreen are a glossy piano-black, which makes them very susceptible to fingerprints and dust. The palm rest area and the rest of the base unit resist dirt really well, however. While the build quality is decent, the overall sturdiness is a mixed bag. The palm rest area resists localized pressure quite well, but above the optical drive and the middle of the keyboard we noticed some flexing. Pressing down in the middle of the speaker bar is accompanied by creaking sounds. 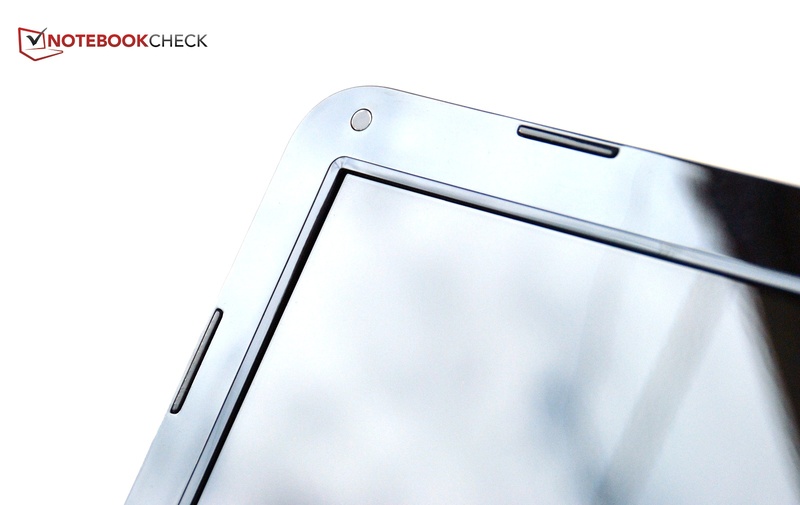 The display lid also flexes, although pressing on the back does not adversely affect the picture on the screen. The hinges are stiff, but can't completely prevent the display from bouncing. The C855-2J4 offers the bare minimum number of ports. The left side houses the DVD-RW drive, followed by a USB 2.0 port and the power jack. There is enough room on the left side for an external mouse. 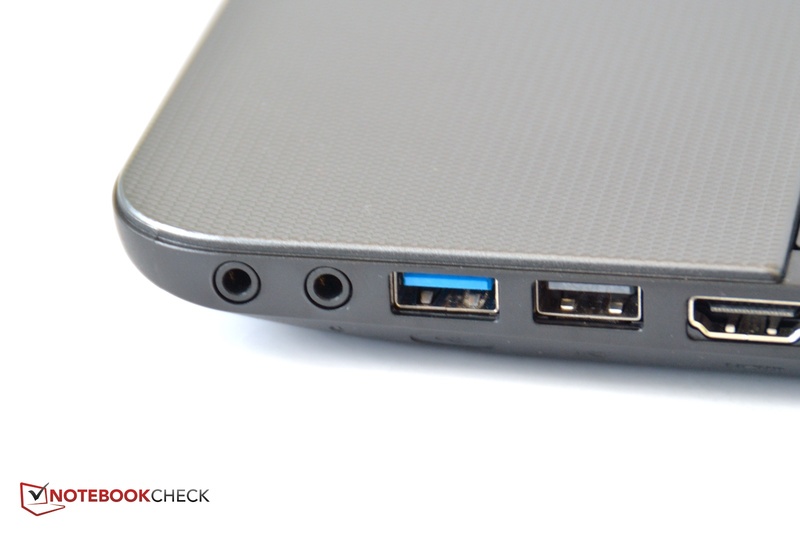 On the right side, the port placement is less ideal: most of the ports are located towards the front, since the rear area of the notebook is occupied by the cooling fan exhaust. Next to the fan exhaust there is the VGA out, the Ethernet and the HDMI port, which in turn are followed by a USB 2.0 and a USB 3.0 port, as well as the headphone and microphone jacks. In our opinion, a single USB 3.0 is certainly not really adequate. The front of the notebook is home to a card reader for MMC and SD cards; the rear has no connectivity. The Satellite C855 comes equipped with both Bluetooth 4.0 and WLAN b/g/n. Our non-scientific reception test showed very good signal strength: even two floors above the router, we still had five bars and no issues browsing the internet. The LAN adapter is a very inexpensive Realtek RTL810, which does not support Gigabit speeds, but rather tops out at 100 Mbit/s. The battery is very easy to remove. A maintenance cover on the bottom of the notebook gives access to the hard drive, the RAM, and the CMOS battery. Both RAM slots are taken up; the C855 can be expanded to 16 GB maximum. The other components are only accessible if the notebook is disassembled further. 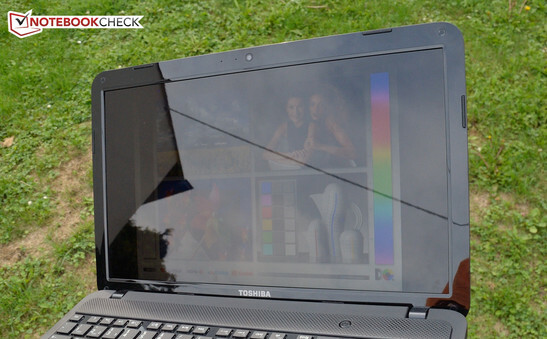 In some countries, Toshiba's warranty covers the notebook against defects for 24 months. The international "carry-in" warranty also includes pickup-and-return service within certain countries. 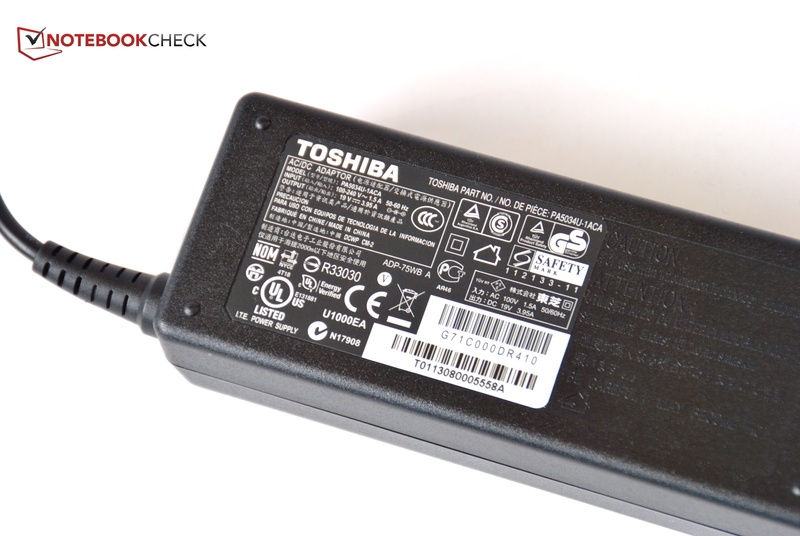 For 64 Euros (~$85), Toshiba will extend the warranty to a total of 3 years; for 4 years, the manufacturer charges 109 Euros (~$150). The keyboard is one of the few differentiators between the Satellite C850 and the Satellite C855. 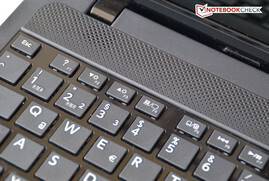 While the former comes with a conventional keyboard, the latter is equipped with a chiclet design. 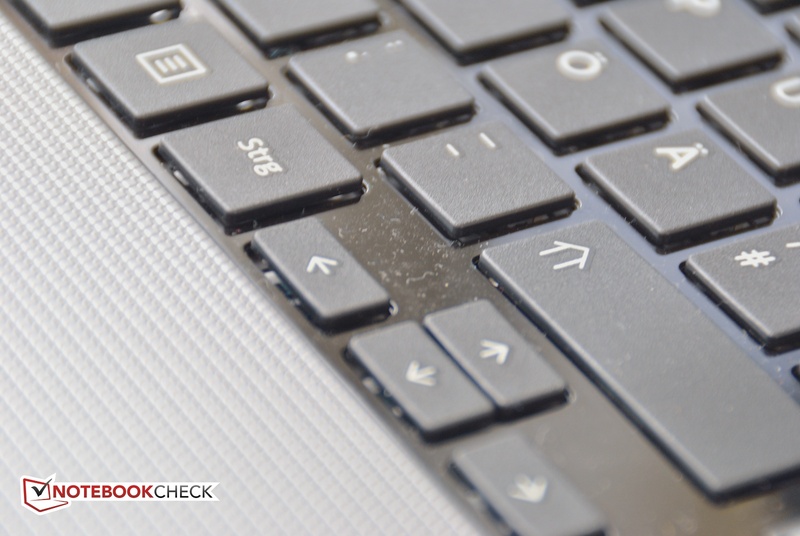 The individual keys have ample distance between them, but the keyboard insert is highly glossy and attracts dust quickly. The keys are completely flat, the travel is very short, and depressing the keys requires very little force. Combined with the spongy feedback, it's not easy to determine if a particular key stroke was recognized or not. For those reasons, we don't think that the keyboard is suitable for touch typists. We do appreciate the inclusion of a dedicated number pad, however. The function keys work in reverse, which means that special functions can be entered without using the Fn key. Those who prefer the standard F1-F12 functionality can change this behavior in the system settings. 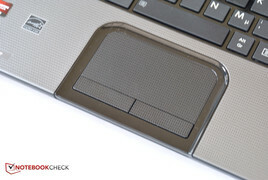 The touchpad and the buttons are lightly textured and fingers glide easily across the surface. The touchpad sits in a glossy frame, which is very susceptible to dust and fingerprints. The edges of the touchpad are not easy to feel, which is actually an advantage for Windows 8 swipe gestures. Sometimes we ended up outside the sensitive areas, however. Inputs are recognized reliably and translated precisely - although we had issues every once in a while. The buttons don't have a lot of travel, but their feedback is adequate. F1-F12 require the use of the Fn key. 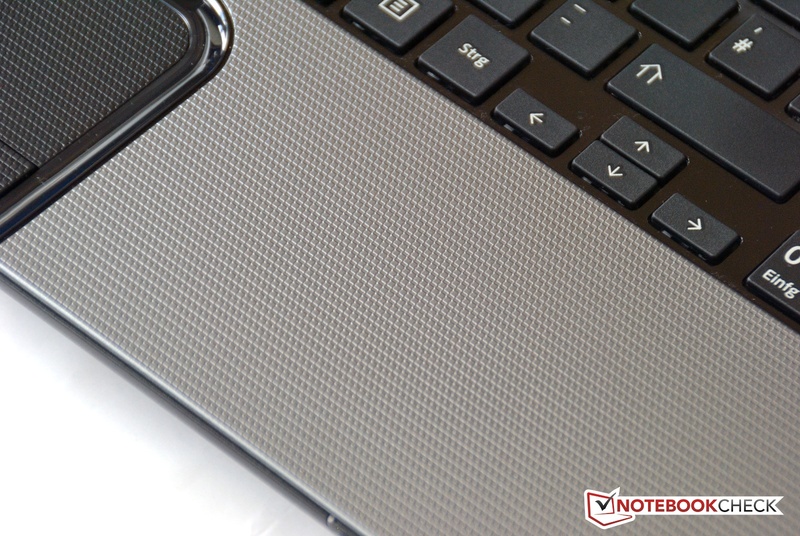 The surface of the touchpad is textured. Toshiba uses a 15.6-inch display from LG (LP156WH4-TLN1). The display features a resolution of 1366x768, which is pretty standard for inexpensive notebooks. The average display brightness of 229 cd/m² is above our expectations for this class of notebook. We recorded a high of 248 cd/m² on the left side; the middle is slightly darker at 233 cd/m². The darkest area is on the bottom and about 35 nits less than the maximum. The average brightness distribution is 86%. The display maintains the brightness setting even when the notebook is running on battery power. 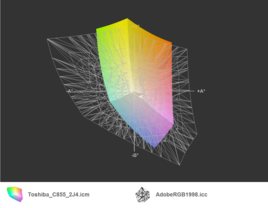 The decent brightness and the black value of 0.46 cd/m² result in a good contrast ratio of 507:1. 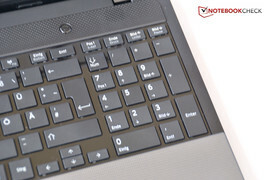 Even though the C850 had almost twice the contrast, our review model still does very well for an entry-level notebook. The display panel of the C855 cannot display the professional color spaces: neither the more demanding AdobeRGB nor the basic sRGB are covered. This shouldn't be a major issue for most buyers, though. When we used a colorimeter to check the display, we saw clear deviations as far as the gray levels and the colors blue and cyan were concerned. Overall, the display emphasizes the blue spectrum and suffers from a bluish cast. Since the display is highly reflective, the notebook is not really suited for brightly-lit environments and direct sunlight. Because of the decent brightness and contrast, the screen content remains readable most of the time, although strong reflections are unavoidable. When the display is viewed from the side, it gets considerably dimmer, although the color accuracy is not impacted significantly. Deviations in the vertical plane cause the picture to darken and the colors to pale or invert. The screen content is now hard to recognize. The notebooks in the series C850 and C855 come in many different versions - there are seven different variants in the C855 series alone. Additionally, Toshiba also offers a series C850D and a series C855D which are based on AMD processors. 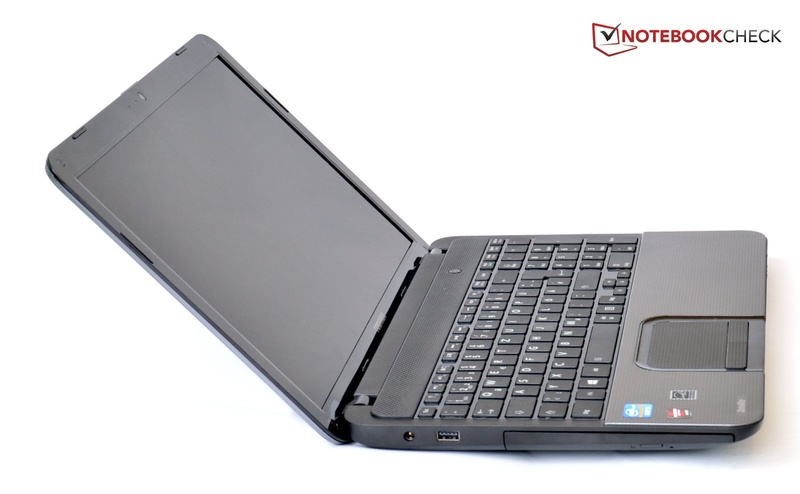 Our review notebook comes with the Intel Core i5-3230M CPU and a dedicated AMD Radeon HD 7610M GPU, which has 1 GB of RAM. A 1 TB hard drive and a generous 8 GB of RAM round out the hardware. The processor is not quite current anymore, as Toshiba uses an Ivy Bridge dual-core unit. Previous generation or not - the 2.6 GHz CPU can overclock to 3.0 GHz via Turbo Boost and offers respectable performance. In this notebook, the CPU reliably reaches the upper frequency ceiling when needed. The results of the Cinebench R11.5 speak for themselves: 2.98 points is top-notch for this particular CPU. 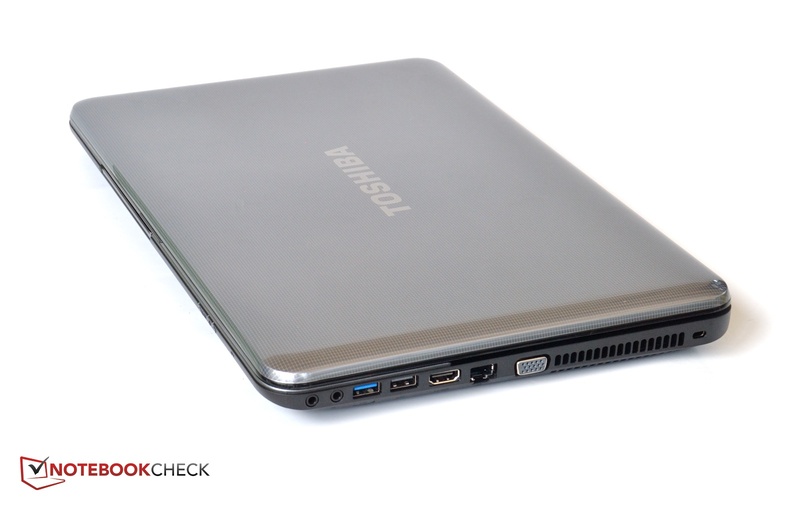 The Toshiba Satellite L855-15U, for example, comes with the same processor but only manages 2.85 points. 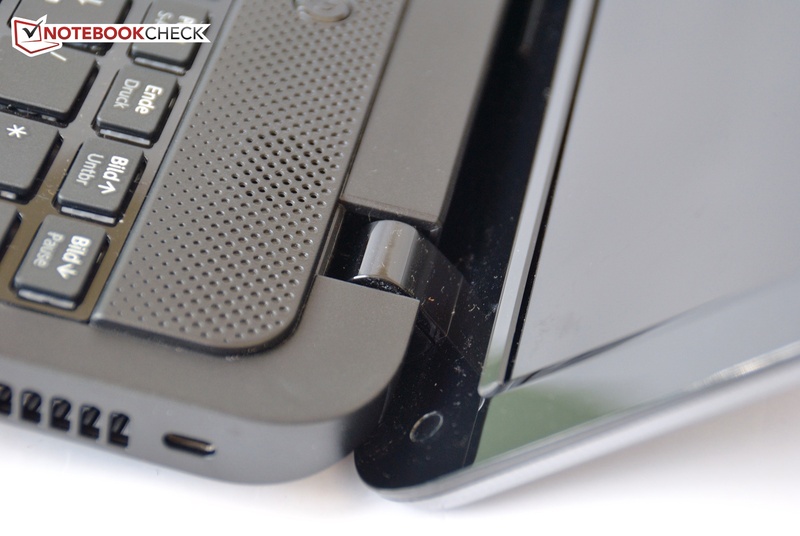 The Acer Aspire V3-571G-53238G1TMaii - again equipped with the i5-3230M - only reaches 2.90 points. The performance does not drop when the notebook is running on battery power. 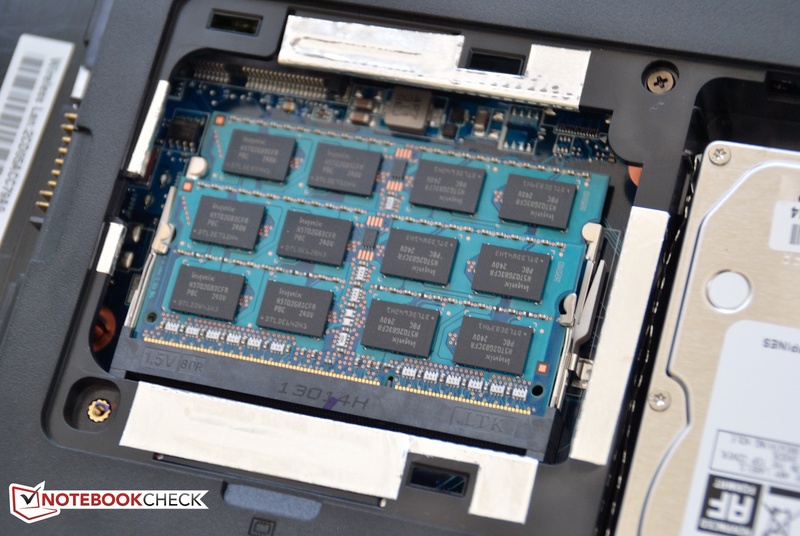 To evaluate overall system performance, we use the PCMark benchmark tests. The C855 scored 2464 points running PCMark 7 - better than the Toshiba L855-15U with 2432 points and slightly behind the Asus Aspire, which managed 2532 points, but also has the benefit of a more powerful graphics card. 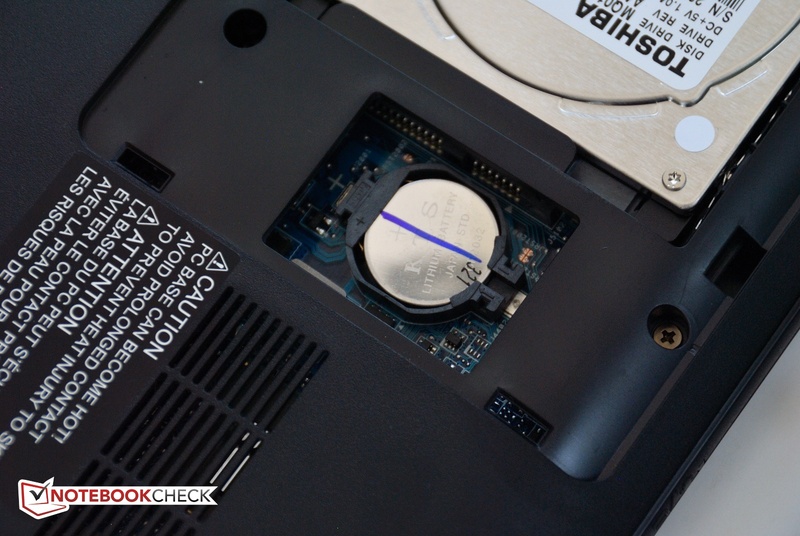 The ThinkPad and the Vaio show how notebooks with SSDs fare in this test. System starts and restarts happen quickly, but opening programs requires more patience at times. 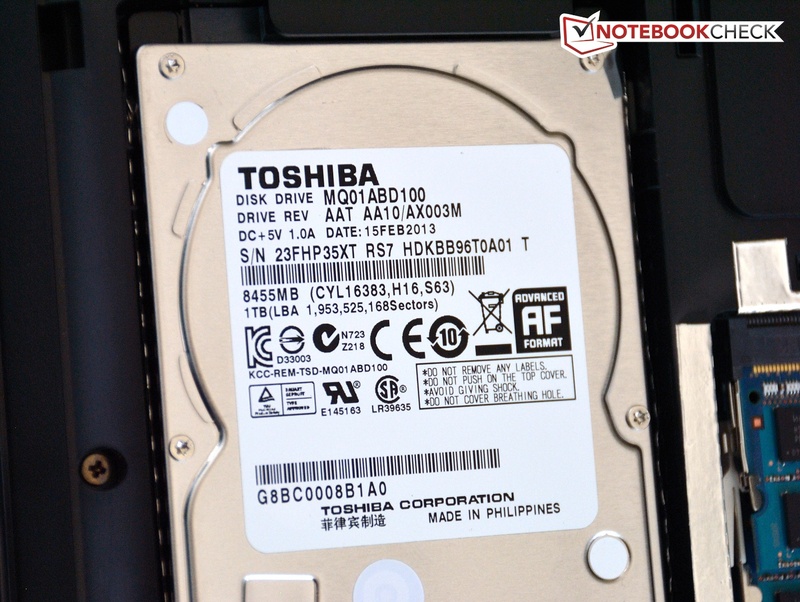 Toshiba uses one of their own hard drives - in this case a 1 TB model. The conventional hard drive features a rotational speed of 5400 RPM and allows for a maximum transfer rate of 62.8 MB/s according to HD Tune, which is rather disappointing. The 1 TB drive in the Acer Aspire is quite a bit faster at about 80 MB/s. The L855 has a 750 GB hard drive and tops out at 71.1 MB/s, which is still considerably quicker. An SSD or a hybrid drive would have been a much better choice for this notebook. The C855 comes with the integrated Intel HD Graphics 4000 deactivated and relies on a dedicated graphics card from AMD instead. AMD Enduro, which normally allows switching between the cards, is also disabled. The AMD Radeon HD 7610M is always in use and requires more energy than the integrated solution would. The Radeon GPU has 1 GB of RAM and operates at a frequency of 450 MHz. We ran 3DMark 11 to get an idea of the performance: 880 points is a much better result than the integrated solution alone would be able to achieve. 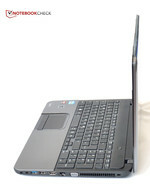 Notebooks with the Intel HD Graphics 4000 as the sole graphics engine usually score around 650 points. The notebook is suitable for gaming only to a limited extent. The graphics card in particular is a bottleneck. Less resource-intensive games like FIFA 13 can be played on high, but the demanding BioShock Infinite requires the settings to be reduced to avoid stutters. 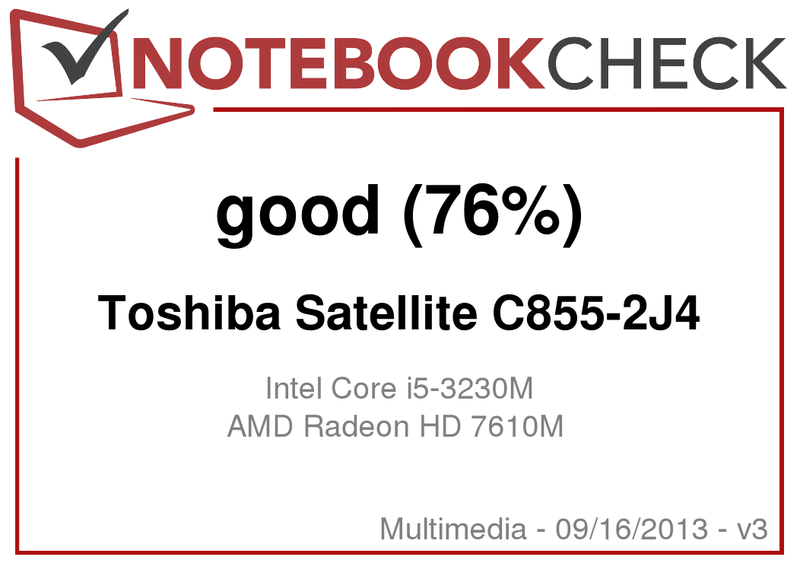 The Toshiba Satellite C855 is not particularly quiet. The notebook is even audible during idle and simple office-type tasks, although the noise level is far from annoying. The DVD drive is pretty noisy at 37 dB(A). Under load, we recorded levels above 40 dB(A), which can be considered obtrusive. The notebook remains very cool during idle - especially on the left side. On the right side, the temperature increases to above 30 °C near the fan exhaust. This area also gets quite a bit warmer under load - we recorded a high of 47 °C. The left side remains around 30 °C. We consider temperatures under 50 °C to be acceptable. (±) The average temperature for the upper side under maximal load is 33.6 °C / 92 F, compared to the average of 30.9 °C / 88 F for the devices in the class Multimedia. (±) The maximum temperature on the upper side is 43.2 °C / 110 F, compared to the average of 36.5 °C / 98 F, ranging from 21.1 to 71 °C for the class Multimedia. During the test with Prime95 and Furmark, the processor and the graphics card are simultaneously stressed for over one hour, which also taxes the cooling system. The C855 performs flawlessly here, as the CPU remains at 3.0 GHz, while the GPU maintains 450 MHz at all times. The CPU temperature also only reaches a fairly modest 78 °C. We ran the 3DMark benchmark again after the stress test: the result was identical to the test we conducted after a cold start. Although Toshiba touts an "SRS Premium Sound HD" when talking about the speaker system, we found the sound to be less compelling: piano sequences sound distorted, bass is lacking, and the maximum volume is also average at best. The notebook might be adequate to play back system sounds - for anything else, we recommend external speakers. Since the dedicated graphics card is always in use, the power consumption is slightly above average during idle. With the screen set to its maximum brightness and wireless turned on, the notebook consumes a healthy 15 watts. Under load, we measured a maximum power draw of 56.4 watts. Since we recorded the maximum power consumption during our stress test, the result is not overly realistic and doesn't represent normal usage scenarios. During the 3DMark06 benchmark test we measured only 33.7 watts. 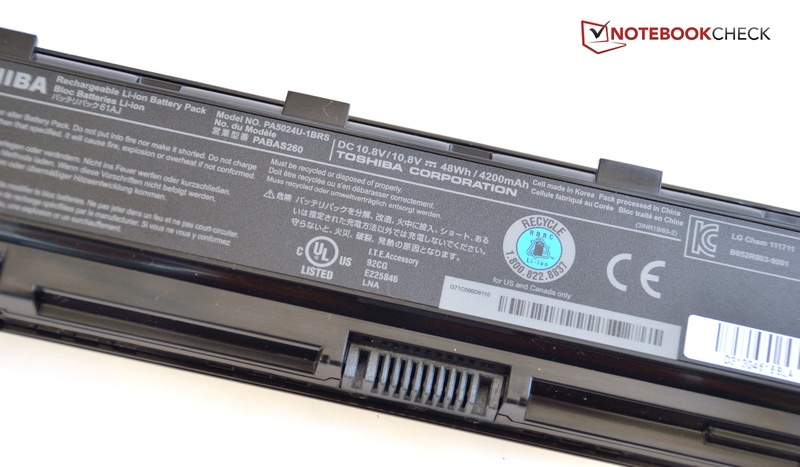 The lithium-ion battery Toshiba uses has a capacity of 48 Wh and is easy to remove and replace. Due to the above-average power consumption at low load levels, the battery life is far from outstanding. For the Battery Eater Reader's Test, we select the lowest display brightness and put the notebook in airplane mode. A script then simulates reading of a text document. The Toshiba C855 was able to last for 4 hours and 43 minutes under these conditions. We use the WLAN test to get a more realistic idea of the battery life. We adjust the screen brightness to 150 cd/m² and use an automated script, which visits different web pages. The C855 shut down after a very short 3 hours 21 minutes. For users wanting to watch DVDs, we would recommend shorter movies, since playback is only possible for about 2 hours. The Battery Eater Classic Test renders a 3D scene and stresses both the CPU and GPU. The result of 1 hour and 14 minutes is actually pretty respectable. Charging the notebook takes 1 hour and 45 minutes. 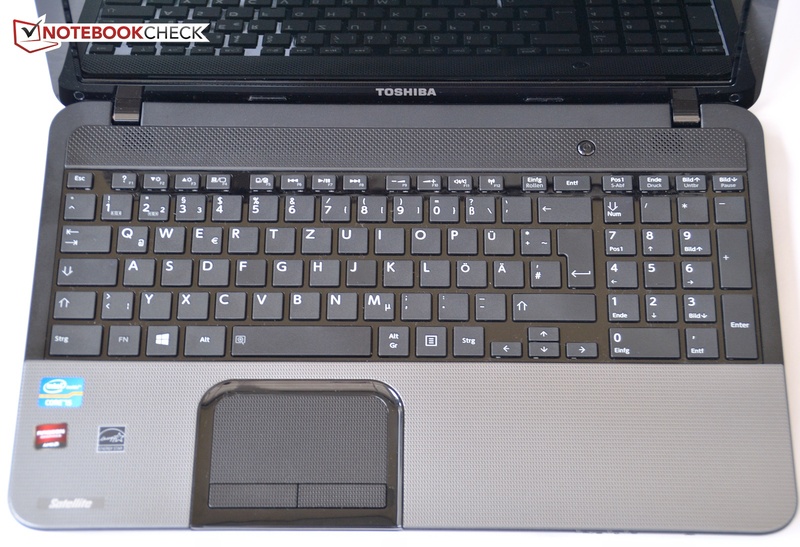 With a price of around 580 Euros (~$780), the Toshiba Satellite C855-2J4 can be considered an upper-end entry-level model. For that price, the user can expect higher performance and the system delivers - although it appears to us that Toshiba did try to save money in the wrong places. The quality of the chassis is in line with the price point. Although there are no major flaws, the chassis does flex too much in some areas. The port selection leaves much to be desired: one single USB 3.0 port and no Gigabit LAN are clearly behind the time. Because of the very limited feedback, the input devices take some time to get used to. 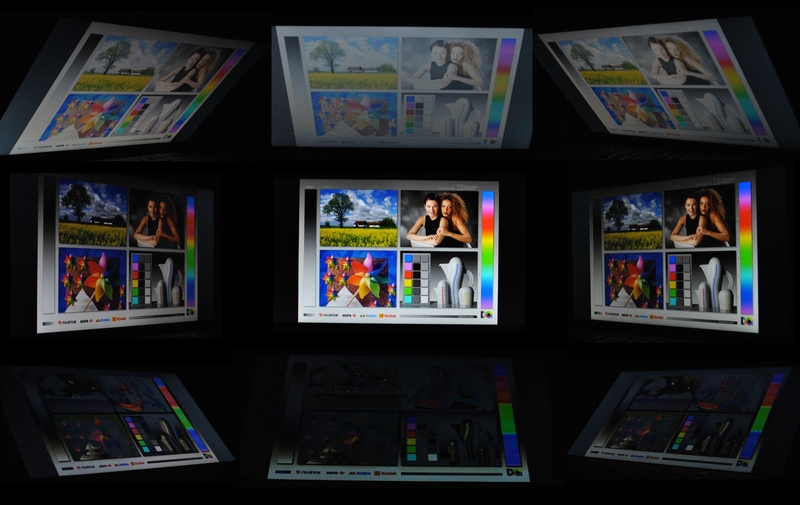 The display brightness is adequate, but reflections hamper the usability in brightly lit environments and outside. The dual-core Intel processor operates at peak performance even when under full load - and the benchmark scores show it. The dedicated AMD graphics card increases performance slightly, but also shortens battery life. 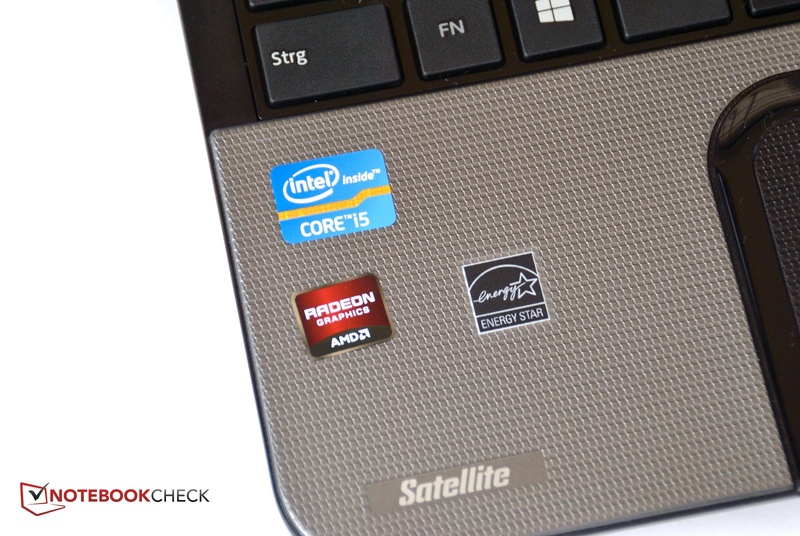 Our tests show that the notebook will last about 3.5 hours on average with wireless turned on. If the drawbacks we mentioned above are acceptable, the Toshiba Satellite C855-2J4 is certainly a usable, although fairly average notebook. The C855-2J4 comes with an Intel Core i5 and an entry-level GPU from AMD. ...and the smooth display lid. Unfortunately, the display is highly reflective. The hinges are reasonably stiff...and glossy as well. Cost savings taken too far: only one USB 3.0 port. ...to a battery with 48 Wh. ...but we would have preferred a non-glare display panel. That Toshiba still only includes a single USB 3.0 port. 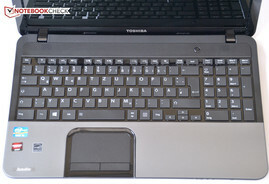 Toshiba Satellite C850-1LX, Toshiba Satellite C50D-A-10E, Lenovo G505s-20255, Lenovo B580-M94A5GE, Samsung Series 3 355E5C-S02DE.